We're bursting excitement here at KidTown Melbourne HQ after this morning's announcement by the Melbourne Symphony Orchestra. The Melbourne Symphony Orchestra (MSO) will present the exclusive Australian premiere of Star Wars: The Concert Series with The Force Awakens on 8, 9 and 10 December 2017 at St Kilda’s newly refurbished Palais Theatre. Featuring a full screening of the film with Oscar-winning composer John Williams’ classic score performed live to picture, led by conductor Nicholas Buc. Thursday to Saturday performances will also feature a pre-conert talk "The Art of The Score" with conductor Nicholas Buc, MSO Senior Manager of Special Projects Andrew Pogson, and film academic Dr. Dan Golding. This informative talk will cover an in-depth dive into the main themes and a look into how these themes are developed throughout the film along with discovering the secret to how the MSO syncs to the film itself. For an extra special treat before the Sunday 10 December afternoon performance there will be a special "Padawan Training" session from 12noon. Let your kids embrace their inner Jedi and learn the ways of the force in a 20-minute class happening at 12noon, 12.30pm, 1pm and 1.30pm. All this, ahead of the release of Star Wars: The Last Jedi in cinemas 14 December 2017. What a treat for Star Wars fans of all ages! 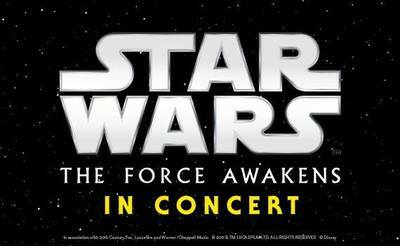 Tickets to Star Wars: The Concert Series with The Force Awakens are now on sale via Ticketmaster.